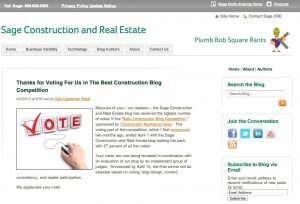 Several bloggers among the finalists the 2013 Best Construction Blog competition have reported responses — including congratulatory emails and calls — and hundreds of voters visited the constructionmarketingideas.com website to view the final judged results. 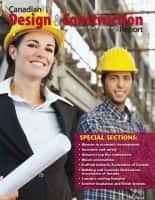 I have some work ahead — it may be a week or two before I communicate and interview the finalists for a more detailed profile of their blogs and businesses. 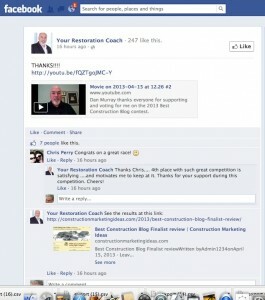 Here is some Facebook reaction from fourth-place Dan Murray’s Your Restoration Coach. Meanwhile, Sage Construction and Real Estate posted this entry relating to the company’s second-place results. I’ve also received several emails, observing the competition’s results. 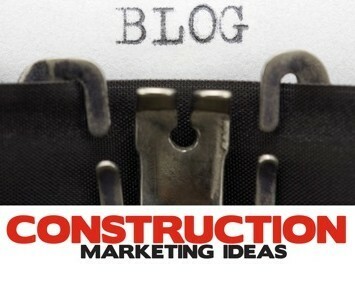 Is blogging — and entering blog competitions — a worthy marketing strategy for your own business or practice? The evidence is “yes” if you are consistent and strive to put your readers’ interests first with relevant and useful content. I’m sure I’ll pull out additional insights from the top bloggers in the next few week. 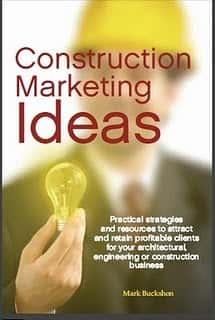 In the meantime, if you would like your blog included in the free Construction Marketing Ideas blog directory, please email me at buckshon@constructionmarketingideas.com. Obviously, the blog must be relevant to the industry and not be a “splog” or designed purely for search engine optimisation.